Intervista (Finding the Words) (1998), Sala’s first video, stemmed from his accidental discovery of two twenty-year-old film reels that show his mother, Valdet Sala, proclaiming the achievements of the People’s Socialist Republic of Albania. Inaugurating Sala’s interest in how language falters in times of historical and political upheaval, Intervista also underscores his awareness of how the idealism of the past manifests itself in the present and informs our ability to imagine the future. 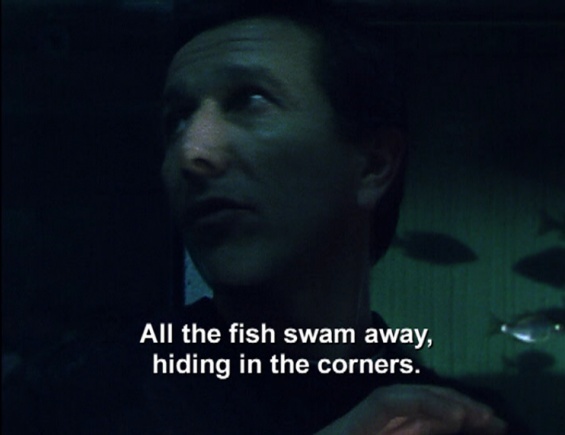 Nocturnes (1999) toggles between intimate portraits of two individuals as they cope with social isolation and anxiety: Jacques, who collects and cares for hundreds of fish, and Denis, an ex-mercenary who battles fictional enemies in PlayStation games. Sala adopts documentary strategies in his depictions of Jacques and Denis, but also edits his footage to weave their narratives together, blurring the distinction between the two men and between fact and fiction. Full support for “Anri Sala: Answer Me” can be viewed here.